Fanciful and modern, the Delrey bench features a luxurious palette and ornamental profile to create the perfect accessory for entryways and other living spaces. 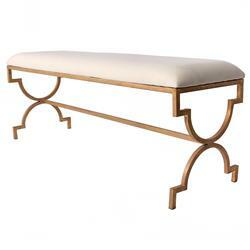 A gorgeous, golden hued brass frame is rendered as two elaborated X-shaped legs and a lengthy connecting bar. The gold contrasts beautifully with the soft cream of the seat cushion.